Here at DorpatSherrardLomont we are are pepped up to write a history of all our big snows. Frankly, there have not been that many. So we will also add some other oddities that have appeared out of the sky or merely rolled in and then out again since that “night of shock” when Seattle founder Arthur Denny discovered that the barrel of pork he purchased and stored high on the waterfront disappeared into the freezing dark of the settlers’ first really “big weather” – the winter of 1852-53. Two shorter versions of this illustrated history preceded it: first in the Winter 2002 issue of Northwest Science and Technology, a UW publication, and soon after as historylink’s essay no. 3681. Both those versions and this longer construction were assembled for the most part from a horde of clippings I copied from the Seattle Times library. Long before the emergence of Google, when I began using the library in the early 1980s there were perhaps twenty Times employees working full time organizing the papers archives and helping Times writers research their contributions. Their cheerful help was one of the delights of writing my weekly feature “Now and Then” for Pacific Northwest Magazine. This third visit to the subject of Seattle snow will use more of those clippings. It will also be distinguished by a greater willingness to digress, a blogger’s privilege so long as these asides do not lead to boredom or insincerity. Its much greater use of historical photographs collected or researched over the past thirty-eight years of studying regional history will, I hope, please. To keep these historical snows in line, we will bind them this third time in the chains of a chronology. We intend to treat the “significant snows” as they came, by date, and in order – except when we don’t. Now, if you like, keep the blinds up on the odd chance that it begins to snow, and perhaps another big one. I begin to write this Christmas Eve. The big family ceremony of opening gifts on this night is as long gone as the reformed Scrooge’s cooked goose. I am left alone with the big snow. Earlier this afternoon I pushed some of it off the roof before it could collect the rain now just beginning to mush-up the wonderland that for these last ten days we have variously enjoyed and exploited. I call it “big” on the authority I just noted, of having written a history of Seattle Snow. I know our snows and this one was big when compared with all the others with the exception of five or six. When stacked beside those, it is variously modest. I’ll begin with a digression, abandoning the chain of chronology I promised above. My first Seattle snow was not a big one, rather it distinguished itself by falling on Thanksgiving evening, 1964. I was one of several guests in the Roanoke neighborhood home of Eleanor and Henry Siegel. That school year Eleanor had hired me to manage the lunchtime playground activities of the older students at her Little School. (It has long since moved to Bellevue.) I was also asked to teach some art, for I was a painter then in my most joyful prime. This arrangement was perfect for she paid me a generous five dollars an hour. Since I worked only an hour and a half each school day, I could give the rest of the day to painting – and often all night as well. In 1964 that $7.50 five times a week easily took care of all my and my scooter’s earthly needs. Henry Siegel, you may remember, was then the concertmaster whom the conductor Milton Katims picked to help rebuild the Seattle Symphony. That night while we watched the falling snow through the big home’s large windows, Henry’s string quartet played for us in their large living room first some Haydn and then some Dvorak. Tonight, however, I will listen to Bach while I begin to illustrate both our larger and odder snows. The Magnificat was a Dorpat family Christmas tradition at 78 rpm. After Bach I have waiting for me on iTunes hours of selections from the opera music of Gluck, recorded earlier off of a Gluckfest on BBC-3. This night I’ll also indulge another Dorpat Christmas tradition: cherry pie. I baked it earlier today, or rather, defrosted it. Reaching now for relevance, it was a thaw that parallels the snow’s. My mother’s preferred name was Cherry. This pie tradition, however, comes with my oldest brother Ted’s return in 1945 from war at Christmas time. He was an ensign in the navy with a fondness for Cherry Pie, which he always capitalized, and a joke he told and named “The Cherry Pie Joke.” This joke is easy to distinguish. It has no punch line, never ends unless shut down, and requires a least some of those listening to know all this while laughing at lines that are not funny. What is – or rather was – funny, then, was not the endless joke but how those who were not in the know responded to it all. One can imagine the potential in this for uproar and humiliation. Ted was allowed to tell the Cherry Pie joke only twice. A third time would have been both boring and painful: boring for the conspirators Ted had enlisted and trained to laugh at his punchless lines and again painful for his victims. After that it was cherry pie only. Every family Christmas thereafter Ted would request that he be allowed to tell the Cherry Pie joke once more, but he was always refused. 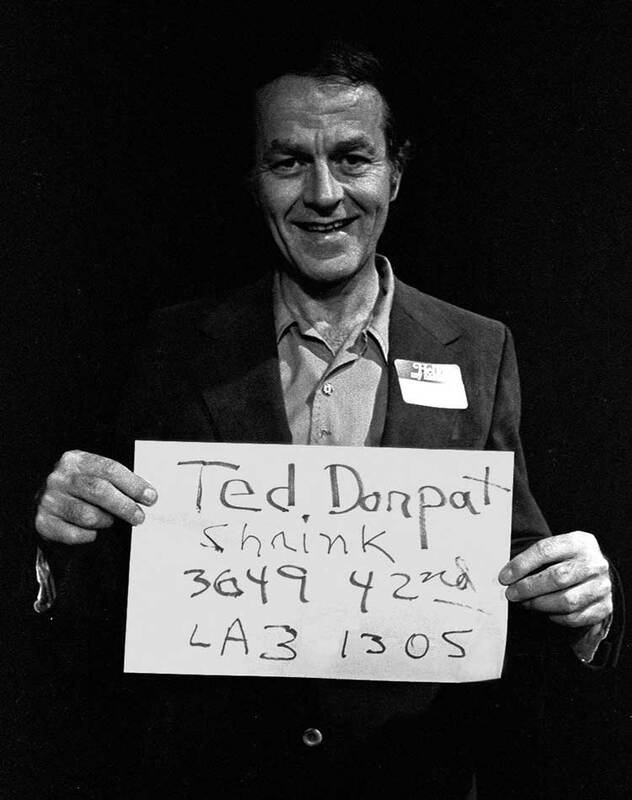 Appropriately, Ted later became a psychoanalyst and spent hours listening to other people’s stories, both abject and grandiose, many of them stories that like his joke were never resolved and ended only upon death. There is another cherry connection within the 1880 view. On its right side is Henry Yesler’s famous hall at the southeast corner of First and Cherry. This was the most popular pioneer venue for theater, lectures, banquets, variety, and community parties. To one of these parties, a costume ball, once came A.W. Piper, the proprietor of the Puget Sound Candy Manufactory and confections shop. Understandably, Piper was popular on account of his sweets, but also for his cartoons and generally good humor. Piper was also the first socialist on the Seattle City Council, although not the last. For the costume ball Piper came dressed as Yesler, and the resemblance was so convincing that Henry returned to his home, which was nearby at the James Street end of the same block, and made a sign, which he carried back to the party hanging from his neck. It read, “The Real Henry Yesler.” Also nearby, in their big orchard, where since 1914 has stood the City-County Building, Sarah and Henry Yesler included among their fruit bearing trees, cherries. And one of the popular confections seasonally offered out of Piper’s “factory” was his cherry pies, which may well have been filled with Yesler’s cherries. 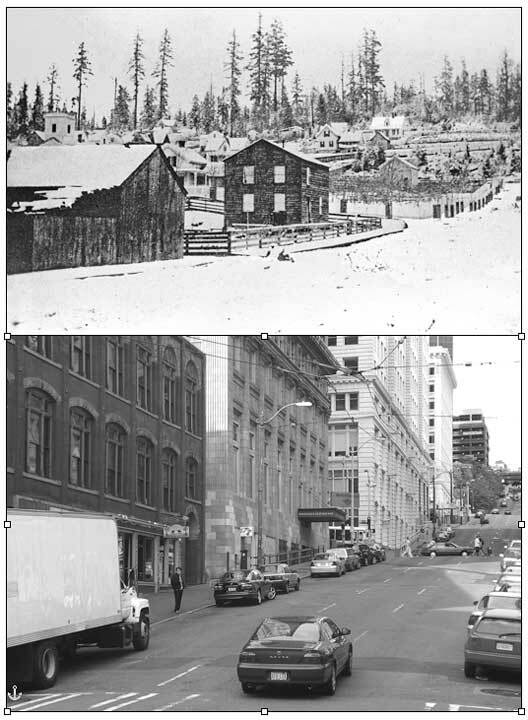 Cherry Street, however, was named for neither Yesler’s trees nor Piper’s pies. Although the taciturn Arthur Denny did not explain it, the street is most likely Denny’s allusion to the town of Cherry Grove, Illinois. 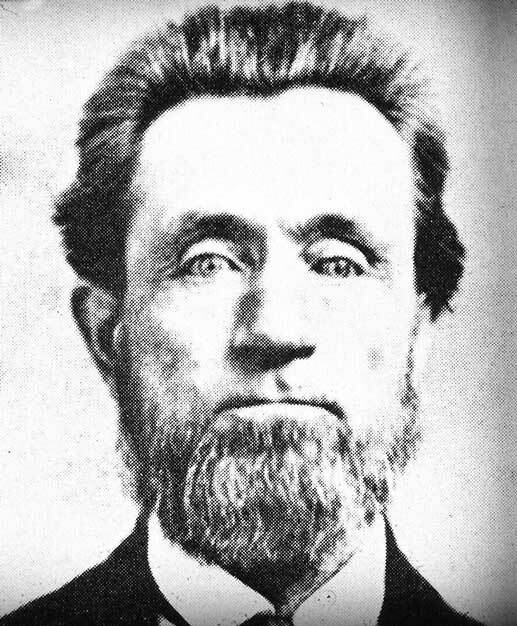 From there the Denny Party began its long trek to Puget Sound in the spring of 1851. Paul–In the paragraph below your brother’s photo you describe the view as looking “west” on Cherry. I think you mean “east”. Hi. Could you research and do a history of how many times Seattle Schools *and possibly outlying areas in the Metro* have been closed or delayed for snow? I’d love to know the most number of days in a row! I wonder if an entire week has been called off! Something’s been bothering me about the 1880 snow scene looking east at Cherry: that building on the right looks WAY too big in relation to the rest of the scene, and in fact looks suspiciously touched-in. I wonder what this photograph looked like originally! There: a mystery for your snowy day.